Selling consulting business is easy when you’re an expert in a burning, urgent need that your clients are desperate to address. How do you identify the next, big consulting spend your clients will make? This one’s easy. Let’s say you trip on a crack in the sidewalk and stumble into Reginald Rollydolly, CEO of Biertaysters, Inc. Holy cow! 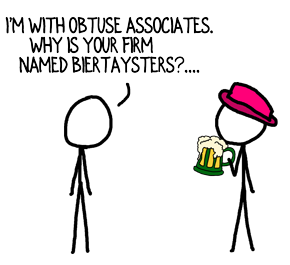 You’ve always wanted to work with Biertaysters. Not only would they be a great client, they’re pretty typical of the industry you serve. If you could deduce the urgent, burning needs that will soak up Biertaysters’ consulting budgets the next couple of years, you could confidently position your consulting firm for growth. After all, you know that building a consulting practice is much easier when you’re Fishing Where the Fish Are; i.e., you’re offering a solution to a problem (or aspiration) prospects are painfully aware of and urgently want to solve. (See this book and this article.) The question is, where will the fish be tomorrow? You want to know your target industry’s emerging issues, strategic thrusts, and nascent challenges, right? Wouldn’t it be amazing to have a crystal ball? Uh, no. You’re overcomplicating this. In reality, that technique is only about 35% accurate**, but who cares? The weatherman’s secret applies beautifully to the consulting business. A business that has previously invested in addressing an issue is more likely than other prospects to seek consulting help on that issue. A business that has previously engaged a consultant to work on an issue is very likely to hire a consultant in the future to work on the same issue. Those laws are highly correlated, of course. Again, who cares? The point is, if you want to know who will buy your services, find out who has spent big dollars in the past to address the challenge your consulting firm is known for solving. The same research also reveals what they’re likely to spend money on next. Every year, residents of Seattle still need raingear, homeowners in Buffalo still need snow shovels and drivers in Los Angeles need cell phones to talk on while they’re stuck in traffic. You show me Biertayster has spent $1 million on process improvement and I’ll bet you Biertayster is likely to spend another $1 million on the same thing over the next five years. As consultants, we don’t have to accurately predict our prospects’ weather; we just need to offer umbrellas to the 35% of consulting prospects who seem to always need them. What challenge(s) do your clients have that they’ve already paid to solve? I’d like to hear what you think your next big consulting project will be. Please share your thoughts in the comments section below. However, Wayne Gretzky used what seems to be a different strategy to achieve outstanding results – “I skate to where the puck is going to be, not where it has been.” Selling the same service as has been bought before borders with selling consulting hours as compared to selling value. It also involves competition with an existing vendor or competition against previous painful experience. Where is the edge? Gretzky was the world’s greatest hockey player and, as you said, he anticipated the play, understood all the variables and skated to where the puck would be. I, in contrast, am a mediocre amateur hockey player and I have neither the vision nor the skills to do what Gretzky did. I skate to the open spot I see now (and then I miss the pass). The oft-cited parallel is Apple. Jobs saw the future and created products ahead of the market. Terrific. Most people don’t have his vision or skill set. But guess what? Other, slower, less visionary companies still make a fortune today in the markets Jobs foresaw. We’re small consulting firms. While we could try to be the Steve Jobs of our market, it’s a very, very, very, low-odds proposition. The much higher likelihood sale is tapping the proven, existing market. Competition is proof of a strong market. As I say elsewhere, competition is your fish-finding sonar. Great question, Anatoli. Thanks for posting it. Aside from working with clients that you have already worked with in the past, how can you identify potential (new) clients that 1) have a problem that you can solve? and 2) have paid for it before? In addition, you may find adjacent spends. For instance, if you know an executive recruiter, then she may be willing to point you to companies that have been investing in solving some personnel gaps. Sometimes, when asking about the problem or challenges the company has found compelling enough to spend money on outside resources, I find people answer with the solution rather than the problem or challenge. For example, they invested in social media web site re-branding. What additional questions can help peel back the onion to get closer to the biz issue and impact that was the catalyst for the spending? David, you raise a very perplexing thought that most consultants have not given any thought. What questions should we be asking that will enlighten us to whether a prospect is a DIY problem solver or is open to listening to outside counsel? 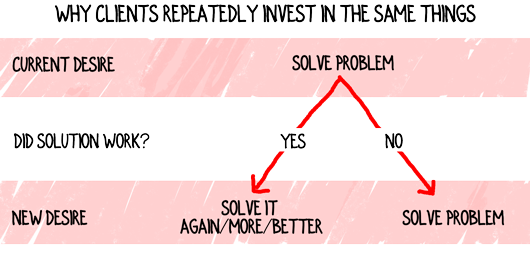 If we encounter a DIY problem solver, the first sale becomes gaining a commitment to use an outsider to solve the problem. Then determine if you are the right person for the job. Great insight, Terry. That’s precisely why I ask prospects what they’ve actually hired an outside party to help solve in the past. 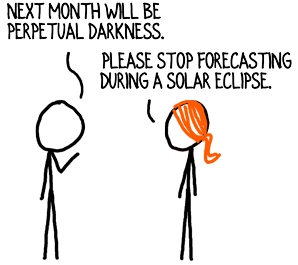 Projections, wishes and maybes don’t do much good. Past behavior, on the other hand, you can bank on. Whether or not it’s worth the effort to “convince” a DIYer to use an outside consultant depends on the situation. As you know, I like to Fish Where the Fish Are; i.e., I find it much easier to sell to clients who want to buy than to try to change someone’s mind if they’re not already in the buying mode. Thanks for highlighting the DIY challenge. David, as a marketing consultant, I have found a big challenge is that local or area branches of a company may be interested in consulting services but the corporate HQ, especially if it’s out of the area, often doesn’t see the value of working with a consultant or believes it has sufficient in-house resources. Even when the local branch can clearly demonstrate that those are not effective in their particular business situation or area market. More than once, I have failed to secure or lost a local client because of this situation. You might say the fish wants to bite, but the parent fish says, na-a-a-ah, just because it looks good doesn’t mean we want to eat it. Advice? Great question, Claudia. Ultimately, the only fish that matter are those who have the wherewithal to grab the hook. The local vs. HQ situation parallels the challenge with a low-level person who sees the need for external resources but doesn’t have the authority to hire you. In all cases you’re looking for combination of urgency, need, and budget authority. When you’re dealing with the person who doesn’t have budget authority, your two paths are: 1) move up the chain to the person who does have buying power and demonstrate the need or, 2) equip your contact to make the case. Both paths present frustratingly low odds of success compared to dealing directly with a decision maker who is aware of a need and wants to address it.